I began djing when I was sixteen years old. I remember listening to my brother’s old rave tapes. Before long I stopped focusing so much on the tunes themselves and honed in on the mixing instead. I soon managed to get hold of a pair of soundlab DLP turntables and the rest is history. 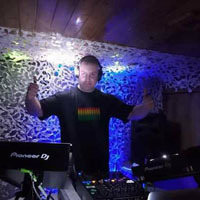 I play trance (old and new), various styles of house music and also a bit of hard dance. I’m a mixer not a scratcher! My favourite DJs are Paul Van Dyke, Ferry Corsten, Matt Darey and Deadmau5. I have my own style and I try to keep it that way. I enjoy watching MMA and boxing fights. I also love a good film. I enjoy spending my spare time with my family and eating out. Music, playing in clubs, my family and managing to get a rare night out! A DJ with a unique style, appreciative of the ‘golden 90s era’ but also a lover of contemporary sounds too. I hope everyone who tunes in enjoys my style. I hope to play different styles every week, so hoping there’s something for everyone!